Conventional braces are the standard treatment method for people with bite issues and other orthodontic problems. The fitting of braces is a very common treatment for children, teens and even for adults. The most popular types of conventional braces are made of metal and porcelain. People who are looking for a more affordable option often go for metal braces. However, your orthodontist will be the one to assess your case and recommend which orthodontic treatment is the most suitable for you. This type of traditional braces uses a stainless steel bracket, which used to give the patient a “train track” look. Today, these visible brackets are much smaller, making them less noticeable than metal braces in the past. 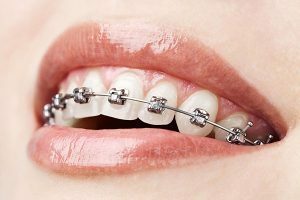 Metal braces are now made more comfortable to wear than before. They also come in different colours, which is one of the reasons they are ideal for children and teens. If you want an orthodontic brace that will closely match the colour of your teeth, you can opt for porcelain braces. They consist of tooth-coloured brackets and blend in with the natural shade of your teeth. Most adults prefer porcelain braces because of their colour and the way they make the wearer a little less self-conscious during the treatment. Porcelain braces are certainly a more aesthetic option than metal braces. On the first visit, separators (small plastic bands) are placed in between your molar teeth. The separators will stay in place for one week. They will create a space between the teeth planned for the permanent molar bands. During the second visit, your dentist will place the molar band, wires, and brackets in place. Every 6 to 8 weeks, you need to see the orthodontist so that he can make an adjustment or to add elastics to the wires and bands. You are required to attend your 6-monthly check-ups so that your dentist can ensure your teeth and gums are in good condition during the entire course of the treatment. After the treatment is completed, your braces will be removed, and your teeth will be cleaned of any remaining cement. You are then required to wear retainers to hold your teeth in position while your gum tissue and bones settle. The retainer can be either fixed or removable. If you have bite issues, consult us at Cardiff Dental today. Orthodontic problems can eventually affect your oral health and wellbeing. Your trusted Cardiff dentist will do a comprehensive examination of your condition to see what orthodontic treatment is the best for you. Orthodontic treatments such as conventional braces are designed to help you achieve good oral health. Straight teeth are healthier teeth. Contact us on (02) 4954 6888 today!